The commander of Wisconsin troops in Iraq says the situation for his soldiers remains secure. In an interview with a Wisconsin television station, 32nd Infantry Brigade commander, Colonel Steven Bensend says he sees little to worry about regarding the security of his 3200 troops. "We feel fairly confident that the Iraqi forces have made the correct steps," said Bensend. "They&apos;re doing a great job, and security has not degraded at this time." 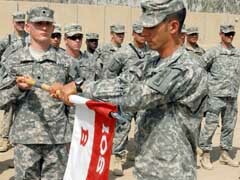 U.S. combat forces have pulled out of Iraqi cities, but Bensend notes that has very little to do with the activities of the 32nd Brigade – which is not considered a major combat unit. "Their jobs are mainly in support, security type missions, and also working with some of our Iraqi counterparts," said Bensend. "Most of our soldiers are on bases that have internal security, and their security is not in jeopardy at all, at this time." Iraqis celebrated in the streets Tuesday, as ceremonies marked the formal handover of security from U.S. to Iraqi forces.